Minnie Mouse and Melman join our collection. Melman - the giraffe completes the Madagascar 2 set (with the characters Robb received with the boxed set dvd for his birthday). Minnie joins Mickey as part of the Mickey's Clubhouse set. Minnie joins 3 other likenesses currently in the collection. Ya hoo! 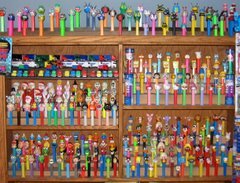 LOOK AT THOSE PEZ! Thank you Thank you!